macOS 13 (High Sierra) - compatible or no? Would like to know too: anybody has tried the 10.13 beta? In the latest beta, we found a couple of issues with Insync. One of them is a crashing issue when trying to set up Insync to start up on login (this causes a crash on first run of Insync on a system). Syncing is working fine otherwise, with the usual caveat of avoiding syncing those that are already being synced by other syncing services (e.g. iCloud Drive). Please let us know of other issues you’ve encountered. marte, so besides the crashing issue, which I’m assuming is a nuisance but not a showstopper, can I safely upgrade my machine to High Sierra and be sure that it will work fine with Google Drive? I need to be sure, because I depend on GDrive and InSync for my business. I forgot one important question: did the machine you tested the beta with have an APFS hard drive? Im running on APFS and High Sierra since the pre-GM beta and now on the official release - not seeing any issues so far. Thanks Alexej, you’ve been very helpful. In High Sierra if you select what files to sync in the welcome page (print attached), the finish button doesn’t work. 2.) I can’t get isync to start on login. When I try to set the option in settings to do that, isync crashes. This is causing huge problems. I did not even intent to update to High Sierra but they pushed the update out replacing the Sierra update (I was updating to Sierra from El Capitan). Now I’m on High Sierra and I’m screwed for syncing. Please help! I’m running insync on high sierra (10.13.0). for me, insync seems to have quickly gone through thousands of files, some in the ignored list. I feel it is just recalculating hashes or something. as much as I can see, no files or folders from ignored list or unselect folders synced. the 2nd issue is real. I am seeing this issue – Insync crashes when trying to set Insync to start on login – in macOS 10.13. It is not just on the first run, it happens every time. Any resolution on this? Yes, we’re working on this crashing issue in High Sierra. Yeah I’m getting the same issue as @AniG. Thanks for the work @marte. Hello. I’m having the same problem. I migrated to High Sierra. I started having problems with my sync (but since it is not something that I do every single day, because my sync depends on external harddrives) I didn’t notice there was a problem. 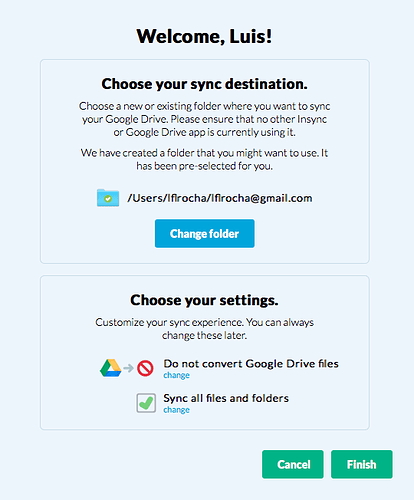 Insync deleted all my synced files in gdrive and now wouldn’t sync. Are you close to having a solution for this? I’m having the exact same problem as @lflrocha Any beta versions with possible fixes? I really depend upon InSync! I have exactly the same behaviour once migrated to High Sierra. I started realizing there was a problem, after I noticed the 100% cpu gauge in process monitor. Insync is not working at all while cpu is high. Any news about a possible fix? Thanks a lot. Insync crashes for me, too. High Sierra with insync v. 1.3.17. It’s a major issue for me since I rely on it for business. I was able to work around the inability to toggle “start on login” without crashing the app (on MacOS 13) by doing the following: reinstall Insync app and, while leaving the “start on login” box unchecked, navigate to MacOS “System Preferences”; then “Users & Groups”; then “Login Items”, and then use the “+” sign to add Insync from the “Applications” pop-up. Checking back on the Insync App status then shows the “start on login” box is checked and the app now starts upon cold boot and restart (without crashing). Hope this works for you. A fix for High Sierra is now available.